AN ANNUAL favourite, the Irish Baroque Orchestra’s production of Handel’s glorious masterpiece, Messiah, returns to Galway on Saturday December 10 at 7.30pm, with the work directed by the artistic director of the Irish Baroque Orchestra, Monica Hugget, world renowned for her expressive and impassioned performances. Hugget’s expertise in the musical and social history of the baroque era is unparalleled among performing musicians. This huge body of knowledge and understanding, coupled with her unique interpretation of baroque music, makes her a most exciting choice as director of the Messiah. The performance, organised by Music for Galway, takes place in the Galway Cathedral, where the IBO will perform with the Resurgam chamber choir and soloists Katherine Crompton (soprano ), Raphaela Mangan (mezzo soprano ), Owen Gilhooly (tenor ), and Tristan Hambleton (bass-baritone ). Ahead of the IBO’s visit to Galway, orchestra leader and violinist Claire Duff took some time to chat about Messiah and what it is like to play in a period orchestra. Duff is an eminent baroque violinist whose "stylish solo violin playing" (Gramophone ) has been described as having ‘all the excitement of a high-wire act’, (The Irish Times ). She was recently elected an Associate of the Royal Academy of Music, London, which is awarded to former students who have made a notable contribution to the music profession. As well as playing with the Irish Baroque Orchestra, she has also led Florilegium, I Fagiolini, English Touring Opera, The Kings Consort, and Camerata Kilkenny. She has co-led the Academy of Ancient Music and played principal second with The English Concert. Her extensive discography includes a highly acclaimed album of Bach's Double Violin Concerto, with Monica Huggett and the IBO, and more recently, a recording of Telemann's concerto for two violins and bassoon. 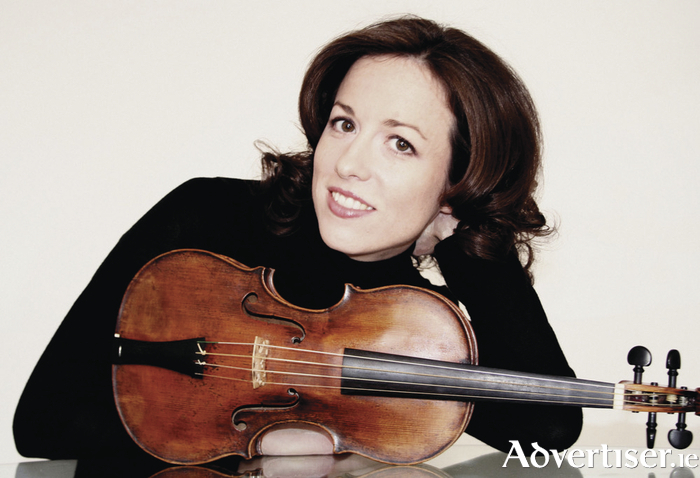 She is passionate about music education and is teacher of baroque violin at the Royal Irish Academy of Music. I began by asking how she was first drawn to baroque music. Duff has been involved with the Irish Baroque Orchestra since its inception some 20 years ago. While study and work engagements took her to London, Amsterdam and elsewhere she still flew back regularly to perform with the IBO. She describes the unique characteristics of playing on period instruments: “For a baroque string instrument a big difference is the baroque bows are designed quite differently. The lower half of the bow is heavier than the tip; the wood thins out toward the top. So when you play an upward stroke it is quite light, and that inequality between the down and up strokes is brought out in the music and is much more articulate; you can do lots of short, fast, articulate notes. You play it in a more rhetorical style. Messiah famously had its premiere in Dublin in 1742. Handel subsequently reworked it at different times to adjust it according to the players and singers he had at his disposal. The piece has also been adapted and reworked many times after Handel’s death. Which version does the IBO perform? Messiah shows Handel at the height of his powers, as its great vocal numbers tell the story of the Christ’s birth, death, and resurrection. Get to hear it in all its glory at Galway Cathedral performed by a stellar cast of musicians led by someone with the deepest affinity to this music. Tickets are €25/20 through Music For Galway (091 - 705962, www.musicforgalway.ie ) or Opus II, High Street.